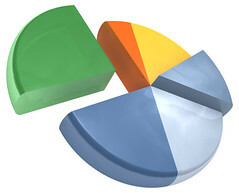 I know that 3D pie charts aren't as clear as their 2D counterparts, but I still think there is a place (and hopefully a market) for pretty charts like this. Even if it isn't a money-spinner, its still an interesting project, with some fun problems to solve! Is this the one made with POV-Ray, or am I mixing you up with another blogger's post? Either way, looks good. I love the effects POV-Ray gives, and it's pretty easy to use. Sorry - Will M., not Duncan M. - my apologies. If you just want anti-aliased TTF rendering then use pyglet. No cairo dependency then. Carl, yeah its done with POVRay. I create pov files with Mako templates. Richard, Can Pyglet be used without a window? ie Just to load a PNG, draw some text on it and save? You may want to use "merge" instead of "union" in your povray source to loose the inside edges especially visible in the green piece of your pie. Hey Will. pyglet will want to be *able* to create a window - it does need to create a GL context, but can do so without displaying a window.